CLOVERMAIL – HAL Communications Corp. 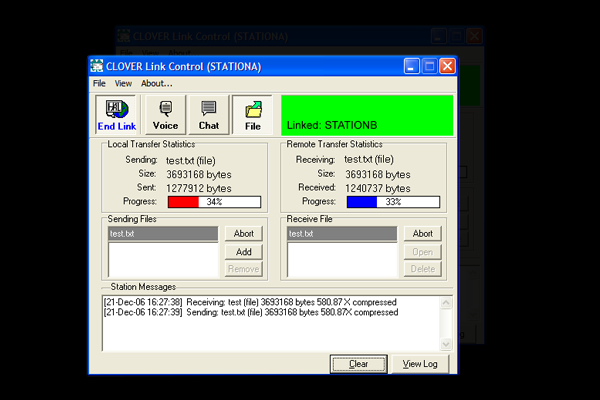 The CLOVER Mail system works with standard inexpensive HF, VHF, and UHF transceivers. These radio frequencies cover all distances and terrains without telephone or IT infrastructures. Radio network management is made easy through password protected configuration screens. CLOVER Mail runs unattended and hidden transferring mail wirelessly without user intervention. Private networks are in-house eliminating costly airtime charges and fees and users utilize simple email software reducing training expenses. Channel use time is reduced with advanced compression, channel selection, scheduling, and collision avoidance features. CLOVER Mail completely eliminates TCP/IP overhead and latency issues. No more news to load. Please click the link below to download Firmware Update Software for HAL DSP Modems(zip file).